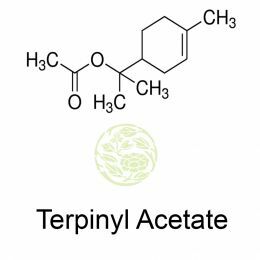 Terpinyl acetate with molecular formula C12H20O2 is found in pine oil, cajeput oil, pine needle oil, cardamom oil and many other essential oils. It has a liquid appearance and has the smell of lemon or lavender. H2SO4 is used as the catalyst agent with acetic anhydride for acetylation on terpineol to produce terpinyl acetate. It has a stable property and it is difficult to change colour. Terpinyl acetate is used majorly as an aromatic. It is widely used in lavender, bergamot, forests and fougere of fragrance. 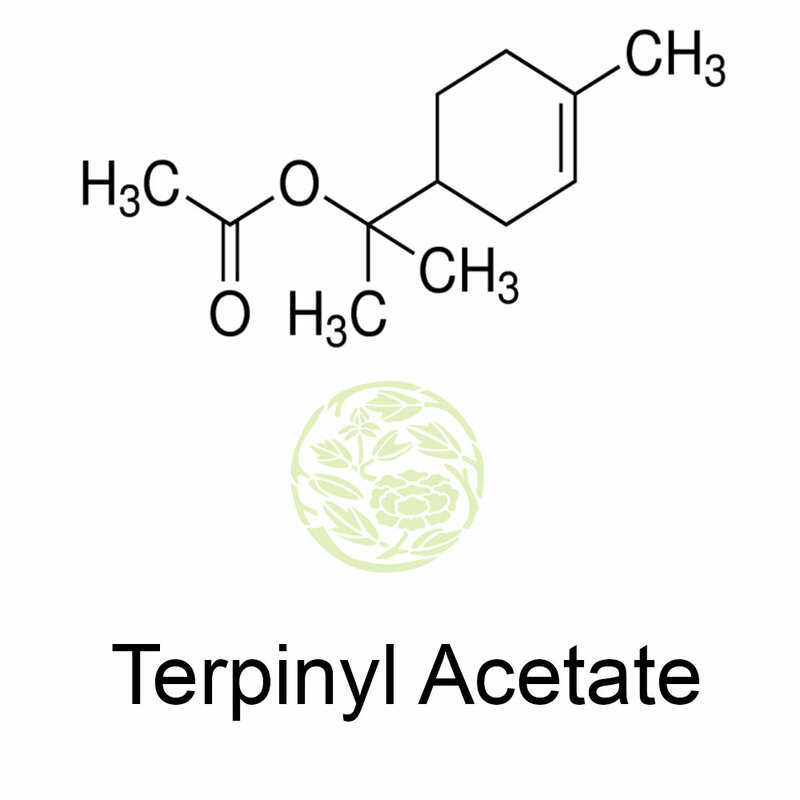 Terpinyl acetate is widely used in artificial essential oil like lemon and lavender oil. It is used as food flavouring in pears, plums, apricots, cherries, citrus and many other fruits of flavouring. The other names of terpinyl acetate are terpineol, acetate; p-ment-1-en-8-yl acetate. It has an appearance which is colourless to slightly yellow liquid and has odour which is flowery, bergamot and lavender. The refractive index is 1.464 to 1.470 and it has a relative density of 0.952 to 0.972. It contains not less than 97% of terpinyl acetate. To get an odour of terpineol add 5 ml of ethanolic and 10% potassium hydroxide TS to terpinyl acetate and heat with a reflux condenser in a water bath for 1 hour. The typical odour disappears and an odour of terpineol develops. After cooling, add 6ml of water and 2ml of diluted hydrochloric acid and this solution responds to tests for acetate as mentioned in qualitative tests. The specific gravity of terpinyl acetate is 0.956-0.965. Thymus pannonicus is a perennial herbaceous plant found in Central and Eastern Europe and Russia. It is also known by names Hungarian thyme or Eurasian thyme. This plant grows over open dry meadows, grasslands and rocks. The main component of thymus pannonicus essential oil is terpinyl acetate, especially in the oil which available from the southern parts of Vojvodina province in Northern Serbia. The other constituents found along with terpinyl acetate are terpinen-4-ol, thymol, carvacrol and geranyl acetate. The thymus pannonicus from Hungary have both thymol and p-cymene and not terpinyl acetate. But there are localities in Hungary where thymus pannonicus has components like terpinyl acetate in abundance along with other components like thymol, geranyl acetate, linalool and many more.